Editor’s note: With the Saints (so far!) playing an encore of their historic 2009-2010 success, we repost (with a bit of updating) this story originally published during that initial path to glory. 1. a person who vigorously maintains or defends a seemingly hopeless position. My personal journey to Who Dat devotion began in the ’80s, when my father started taking me with him to the Dome by the time I could walk. In those formative years, the Saints were mostly the ‘Aints, as the team experienced many painful years of losing seasons. Yet I still loved going to the games and learning about professional football, the best sport to watch in person or on TV (See: diehard above). There were so many intricacies to the sport — from the endless formations to the coverage packages to the variety of penalty types. Football may seem violent and barbaric to the casual observer, but my dad taught me that the strategy required is much more like a game of chess. I was fascinated by pro football’s complexity on the field, and the utter devotion of its fans off the field, even during (especially during) those bleak years. My dad and I rarely missed a game, even when times were so tough that fellow fans left extra tickets on their car windshields — and more often than not, the tickets would multiply before game’s start, rather than go to use. Back then, for Saints fans, the emphasis was on the last syllable of diehard. We stayed loyal nonetheless. For me, Who Dat love has been a lifelong relationship, for better or for worse. I was in the Dome when we won our first playoff game against the St. Louis Rams in 2000, a euphoric experience after 33 years of postseason failure. I endured the Aaron Brooks era. During college years at Dartmouth, a stone’s throw from Boston, I faithfully went to the student center every Sunday to meet up with the one other diehard Saints fan on campus to watch the game. It was a difficult task, but my duty (See: diehard above). And my despair over our poor play was only heightened by the concurrent success of the Patriots: The Pats won the Super Bowl three out of four years during my college tenure. I still actively root against the Patriots as often as possible. However, I would never trade my devotion to the Saints for the chance to grow up as a fan of the San Francisco 49ers or Dallas Cowboys, two teams that experienced great success during my childhood. I remember being in the Dome for the Saints home opener after Hurricane Katrina in September 2006, as well as traveling to Miami to watch the Saints win the Super Bowl in February 2010. These two moments would never have been as sweet without the years of frustration and emotional toil that preceded them. Diehard fans must suffer the lowest lows to experience the highest highs. From my years of experience, I have learned that it takes a diehard to appreciate a fellow diehard. So I consider myself lucky to have a husband who is as passionate about the NFL as I am. It’s not so lucky that he is a diehard fan of … the Seattle Seahawks. There are some things that even true love can’t conquer, and a divided household is a true test of one’s relationship … especially in this city. At least he’s not a Falcons fan. 10. You believe important factors, such as your attire, game-watching locale or choice of refreshments, will have a direct effect on the outcome of the game. 9. When a bad play occurs, you yell obscenities at the television loud enough to scare your pets. 8. You are in a state of complete euphoria the entire week after a Saints win. You read every possible article you can about the victory. 7. You are in a state of utter despair for the entire week after a Saints loss. You shun Sportscenter and all articles detailing the loss. 6. After a loss you do not want to receive any type of contact from a fan of the opposing team; for instance, a text such as ‘good game’ can create an irrational amount of anger directed toward the offending party. 5. You do not care about watching a ‘good game’ when your team is playing; a blowout victory is much more preferable. 4. You go to great lengths to watch every Saints game, even if you have to reschedule a flight or plan your vacation during a bye week. Setting a wedding date during the playoffs is a huge no no. 3. No matter where in the world you are, you yell “Who Dat? !” at anyone passing by wearing Saints gear. 2. You opt for the less popular jersey options instead of the obvious choices because you understand that a jersey choice is a key reflection of one’s fandom. I asked for an Alvin Kamara jersey for Christmas last year, during his rookie season. My mom finally scrounged one up on the Internet and it arrived with a return address in Chinese. And the number 42 on it. Ah, well. 1. You know that the ecstasy of winning isn’t nearly as sweet if you haven’t experienced the agony of defeat. February 7, 2010 was one of the greatest days of your life. Hopefully, February 3, 2019, will top it. 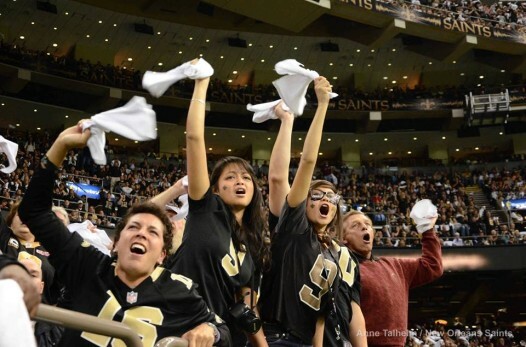 Megan Peck writes about the agony and the ecstasy of being a sports fan in New Orleans for NolaVie. Email her at peck.meg@gmail.com.